An Indonesian passenger plane carrying 10 people lost contact with air traffic control during a flight in Sulawesi island of Indonesia today, officials said. The head of Indonesia's search and rescue agency confirmed an Aviastar Twin Otter DHC-6 aircraft lost contact shortly after taking off from the remote Masamba airport in North Luwu to the provincial capital Makassar at 2:29 pm local time. “We are still waiting for more detailed information but me and my team are flying to Masamba tonight,'' agency chief Bambang Sulistyo told AFP. Sulistyo said the rescue efforts were likely to be carried out tomorrow morning. The plane was carrying four adults, three children and three crew and was scheduled to arrive in Makassar one hour after taking off. Abdul Munir, general manager of Makassar airport, told TVOne in a live interview the plane lost contact eight minutes after it took off. Aviastar Mandiri is an Indonesian domestic passenger airline. The country has a poor aviation safety record and has suffered major disasters in recent months, including a plane which crashed on a remote mountain in Oksibil Papua in August, killing all 54 people onboard. Jayapura, Indonesia // Rescue teams were heading to the site of an air crash in rugged eastern Indonesia on Monday after villagers found the wreckage of a passenger plane which went missing with 54 people aboard. 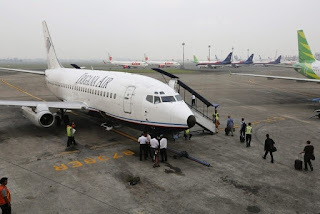 The plane operated by Indonesian carrier Trigana Air lost contact with air traffic control just before 3pm on Sunday after taking off from Jayapura, the capital of Papua province, the search and rescue agency said. The ATR 42-300 twin-turboprop plane was carrying 44 adult passengers, five children and five crew on the flight which was scheduled to take about 45 minutes. “The plane has been found [by villagers]. According to residents, the flight had crashed into a mountain,” said the ministry’s director general of air transportation, Suprasetyo. Search and rescue teams, police and the military would head to the site as soon as possible on Monday, said ministry spokesman J A Barata. Captain Beni Sumaryanto, Trigana Air’s service director of operations, said Oksibil was “a mountainous area where the weather is very unpredictable. It can suddenly turn foggy, dark and windy without warning”. Mr Barata said the weather in the area had been “very dark and cloudy”. Trigana Air is a small airline established in 1991 that operates domestic services to about 40 destinations in Indonesia. Last Wednesday, a Cessna propeller plane crashed in Papua’s Yahukimo district, killing one person and seriously injuring the five others on board. Officials suspect that crash was caused by bad weather.